In February 1914, almost exactly a century ago, a young lineman named George S. Roberts was killed by a high-voltage wire while working in Lindsay, Calif., for the Mount Whitney Power and Electrical company. He left no letters or other documents to help authorities reach his next of kin. But he did leave a photograph of himself, sitting on a moon with a Spokane pennant on the backdrop. Unable to find Roberts’ family, the local coroner in Visalia, Calif., sent the photograph to Spokane’s police chief, William Weir. The Chronicle published the photograph on Feb. 11, 1914. Following publication, men who knew him personally said he’d previously lived in Kamiah, Idaho, and worked as a lineman in St. Maries for several years. They said his parents lived farther south in Idaho, around Lewiston; another acquaintance said they may have moved to Utah. His brother may have joined the Navy the previous year. If the paper wrote about the family again, it does not come up in an archives search, and a search through census records didn't reveal any clear connection to a particular family. 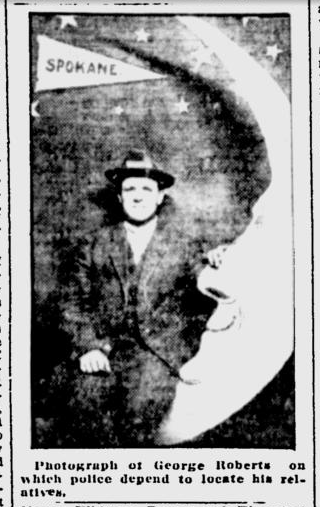 Here's more background on paper moon photos. Does anyone know more about these Spokane photos or where they were taken?